How do you make nanotube membranes? How does a molecular dynamics simulation work? How much computing power does this project need, and why? What is the expected practical outcome of this project? What does the screensaver look like for Computing for Clean Water? 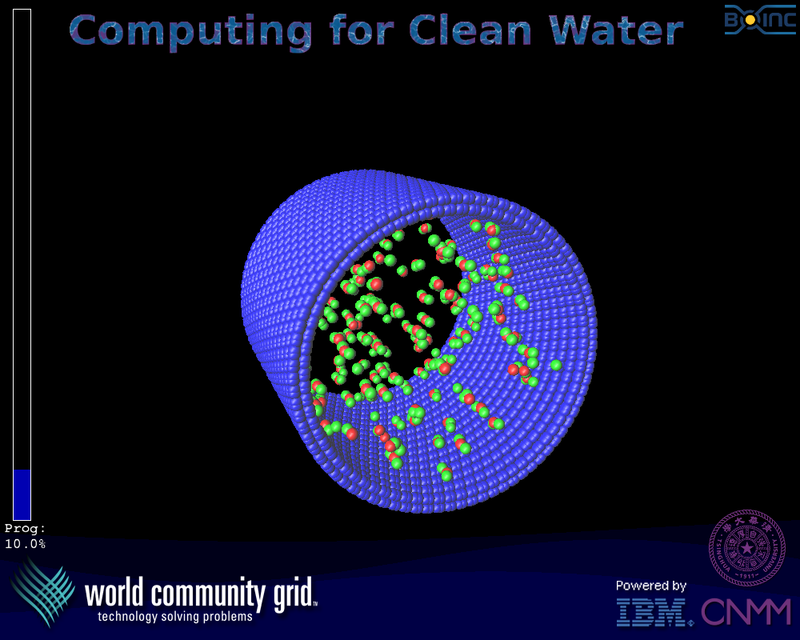 Screen saver/Graphics: Where may I download pictures of the Computing for Clean Water graphics? Screen saver/Graphics: What does the CNMM logo represent? Screen saver/Graphics: What does the blue tube-like object represent? Screen saver/Graphics: What do the green and red bubble-like objects inside the blue tube represent? Screen saver/Graphics: What do the waves in the background represent? In some parts of the world, people take clean water for granted. But in much of the developing world, water is a scarce and often unavailable commodity. In the year 2000, about 8% of the world’s population lived in countries chronically short of water. But by 2050 it is estimated that this number will rise to 45% of the world’s population – by then the equivalent of 4 billion people. Even where water is available, if it is not clean, it can become one of the biggest factors in spreading debilitating and often fatal diseases. Millions of people, including an estimated 1.4 million children, die annually most often from diarrhea, caused by drinking unsafe water. Ultrafiltration refers to the process of reducing or eliminating very small particles from water by passing water under very high pressure through a membrane containing very fine pores. The unwanted particles have a harder time getting through the membrane than the water molecules, so fewer of them appear on the other side. The high pressure needed for ultrafiltration requires expensive equipment and much energy. Any way to reduce the pressure needed in ultrafiltration can make water purification a cheaper and more accessible process. This is precisely what the Computing for Clean Water Project is ultimately aiming to achieve, by first studying in detail how the water molecules flow through filters. To understand reverse osmosis, first consider osmosis. Osmosis is the movement of a solvent, such as water, through a semi-permeable membrane to equalize the concentrations of a solute, such as salt, on each side of the membrane. If, for example, unequal concentrations of salt solutions were placed on each side of a suitable membrane, the water would move from the lower concentration side through the membrane to the side with the higher concentration of salt. By applying pressure on the higher concentration side, the process can be reversed, hence reverse osmosis. So reverse osmosis can effectively reduce salt concentrations, and is one of several major approaches used to remove salt from seawater. A carbon nanotube is made from graphite, the same material that is used in pencil leads. Graphite is a form of carbon – another well-known form of carbon is diamond. Graphite is made of sheets of carbon, just a fraction of a nanometer thick. One nanometer is a billionth of a meter. Under certain conditions, it is possible to grow such sheets so they wrap around and form tubes. The diameter of these tubes is only a few to tens of nanometers, so that is why they are called nanotubes. A nanotube membrane typically consists of nanotubes that have all been aligned in one direction, like the bristles of a brush, embedded in another material that is impermeable to water. One recipe for making such membranes is to first grow the carbon nanotubes on a silicon surface so they all stand up on end. This can be done by first putting nanoparticles of a metal like nickel on the silicon, then letting a chemical vapor containing a carbon compound react with the nickel catalyst, resulting in the carbon growing out of the particles as nanotubes. Once the nanotubes have been grown, a thin film of silicon nitride is deposited around them, so the nanotubes are embedded in it. Silicon nitride is an insulating material similar to glass. Then the underlying silicon is etched away with a chemical that does not affect the silicon nitride nor the nanotubes, leaving a free-standing membrane of nanotubes embedded in silicon nitride. Finally, etching in a vacuum chamber with reactive ions removes the closed ends of the nanotubes, so that nanometer scale pores through the membrane open up. Newton wrote down simple equations of motion to describe how balls fly through the air or apples fall. The world of atoms and molecules is subject to quantum mechanics, which is a good deal more complex than classical Newtonian mechanics. Yet it turns out that by making certain approximations and simplifications, it is possible to simulate the molecular world by letting large numbers of atoms or molecules interact according to Newton’s laws. So the idea of a molecular dynamics simulation is to let things evolve using a computer program which can track every detail of what happens to each molecule over time as it is buffeted by all the surrounding ones. But to get a statistically meaningful picture from such simulations it usually requires repeating the simulations thousands or even millions of times with slightly different starting conditions. It is this computational challenge that this project addresses, by getting volunteers to provide more than a thousand times the computing power that a typical research group would have access. Based on the molecular dynamics simulations that the researchers have done up to now, using a cluster of 20 nodes (160 CPU cores) for a couple of months at a time, they estimate that to extend the simulations to water-flow velocities typical of practical nanotube filters, they will require another factor of 400 or more in compute time. And to simulate a representative range of membrane pore sizes would require a further factor of 10, for a total of order 106 thousand single-core-CPU-years. Add on to this a wide variety of contaminants they would like to add to the water in the simulations, and the sky is the limit! Of course, the researchers will have to go one step at a time, and a lot of the computing effort will be to verify previous results at each stage and to make sure the results are reliable. The research is primarily driven by a desire to understand, at a fundamental level, why experimental results show that water can flow through some nanotube filters far more easily than expected according to the classical laws of hydrodynamics. By getting a better understanding of these fundamentals, the research aims to shed light on ways in which such filters could be improved even further, and lead to more affordable and more energy efficient types of water filters for cleaning and desalinating water. The researchers expect to publish papers in a number of academic journals. Typically, Physical Review Letters and Applied Physics Letters are targeted for similar sorts of research topics. Really big breakthroughs might get into prestigious multidisciplinary journals like Science and Nature. Of course, for any publication that gets accepted, the volunteers on Computing for Clean Water will be the first to know, and will be duly acknowledged in the articles. You can get them by clicking the links for the resolutions below of the example screen shot. The main center of the screen saver shows the atoms of a carbon nanotube surrounding a sampling of water molecules inside. The positions of the atoms match the computation your device is performing at that time. The carbon atoms are shown in blue. The water molecules consist of oxygen and hydrogen atoms shown in red and green. About every five minutes, the nanotube is shown alternately in full size or as a close-up near the wall of the nanotube. More of the water molecules are shown in the close-up view. At the left, the "Prog: nn.n%" shows the progress computing the current work unit in percentage complete. The dark blue background shows waves of water which move slowly and climb in level along with the progress of the work unit. CNMM is the logo for the project team at Tsinghua University. It stands for "Center for Novel Multidisciplinary Mechanics". This shows the approximate graphical and percentage value of how far along the processing of the current work unit has progressed. When it reaches 100%, the computation should be completed and the results would then be sent back to the servers at World Community Grid. 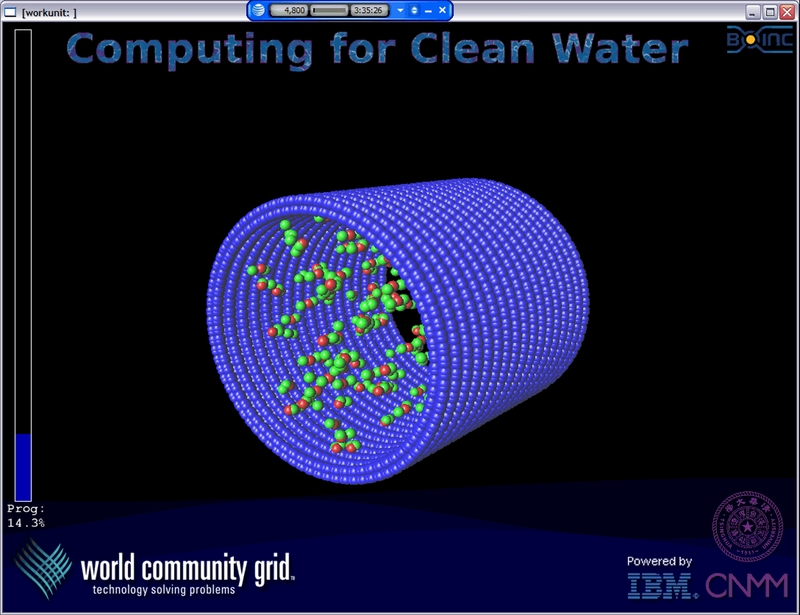 The blue tube-like object represents the carbon nanotube through which the water is passing in the simulation. The blue spheres are carbon atoms. In some of the work units, the carbon nanotubes may have two layers of carbon atoms and in some there may be just one layer. The size of the carbon nanotube may also vary with work unit. Every 5 minutes the screen saver switches between a large view and a close-up view near the wall. The close-up view shows more of the water molecules present there in the simulation. In the larger version, only a sampling of the water molecules are drawn. This is done to limit the computing time required to show the picture. The red and green spheres represent the atoms forming water molecules. Each water molecule has two hydrogen atoms (green) and one oxygen atom (red). Not all of the water molecules are drawn to limit the use of computing time spent on creating the graphics images. The dark blue waves in the background are a background decoration. They move slowly and their level rises with the percentage completion of the particular work that your machine is working on.